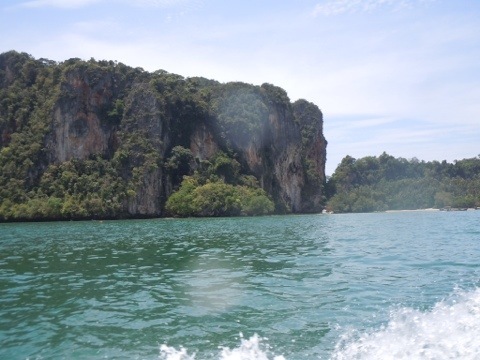 Railay Beach, though actually part of the mainland, is only accessible by taking a long tail boat from Krabi. 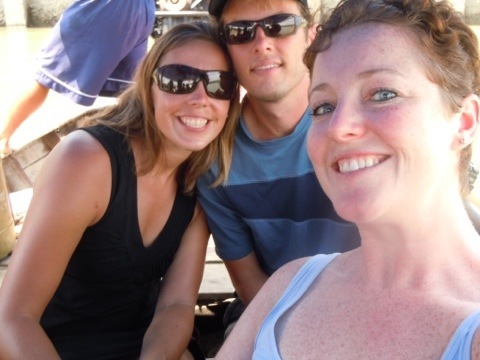 It’s a fairly quick and scenic ride, especially with our recent travel travails. We waited at the pier for another seven passengers (the long tails only depart with at least 10 passengers); we didn’t have to wait long and, in true Thai fashion, the captain managed to squeeze a few extra folks on board for a total of 15. The ride was easy, though a bit disconcerting at first as we realized how close to the water we really were. As we sped along, the coast line changed from flat, forested areas to more dramatic vistas with massive cliffs jutting from the water. A small strip of sand and a few resorts soon came into view and we were depositing on Railay Beach East. 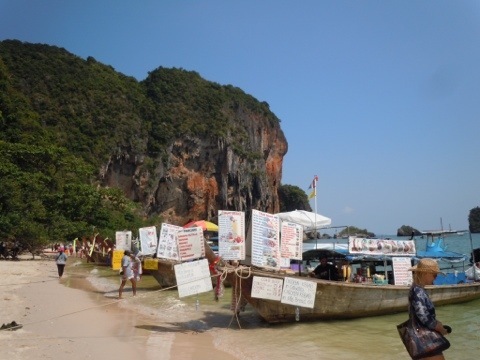 Railay Beach East, where we stayed, is the funkier side with a ton of shops, restaurants and various lodging options. While there are “resorts,” the options are more affordable because there is very little beach. 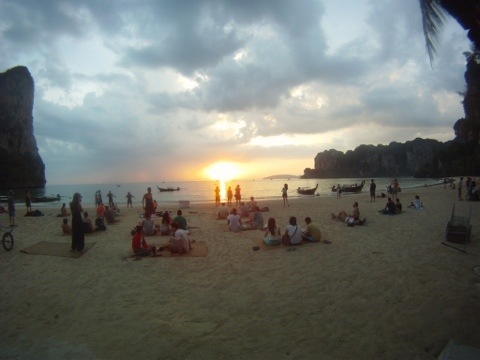 Railay Beach West, an easy five minute walk from the East side, has the gorgeous beach and fabulous sunsets. While the resorts are nice, this beach is more crowded and you’ll pay double what you will on the east side, for lodging and sustenance. Tonsai Beach is tiny and has just a few lodging options and beach bars. Known primarily as the climbers’ hangout, Tonsai is very laid back and, while cheaper, is not for everyone. Pranang Cave Beach, known as “the most beautiful beach in the world,” is gorgeous and is just a short walk from Railay. There are no lodging options here, but there are snack boats if you get hungry while sunning. We knew we wanted to stay on the east side, but hadn’t made plans as to where when we landed. 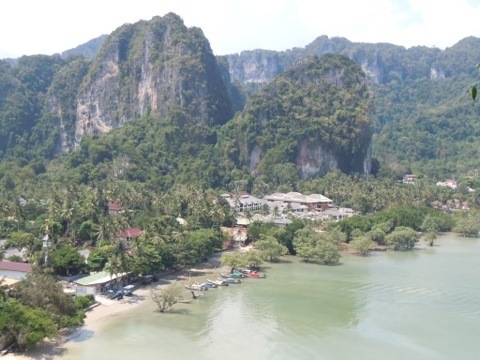 Looking at a couple of options has worked in other places, but we soon learned that the best deals in Railay would be found online. 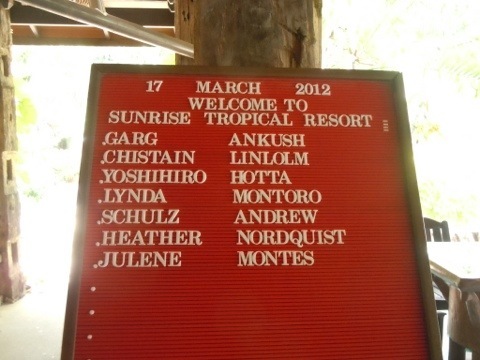 After looking at five different resorts, we booked a night at Diamond Private Resort. It’s located up some 35 meters (by some very questionable steps) from the beach and, as one girl told me when I asked, was the nicest cheap place in Railay. And it is: nice people running it, a great pool and fabulous views. The room was okay, nothing special, but the bathroom was not okay as the toilet kept creating a steady pool of water in the bathroom. One night was enough. 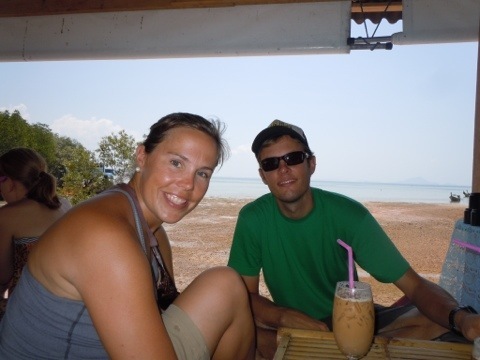 After availing ourselves of the pool (we were quite toasty after our room searching), we headed over to Railay West to check out the beach and perhaps get a snack. 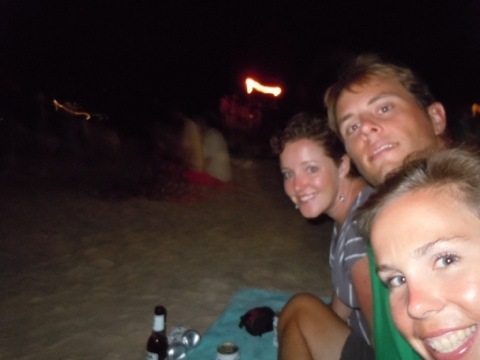 We found what is now my favorite beach bar in Thailand, the Flametree Restaurant, which is situated at the end of Walking Street and lets you perch in the perfect position to watch the sunset. Drinks were pricey, but the location was fabulous for us and my new friend, Jose, who shared the bench with us and chatted until his boyfriend took him away. Dinner was at Easy Bar, with some of the best Pad Thai I’ve had so far. The next morning, we got online and searched both Booking.com and Agoda.com, two popular sites in Thailand. For about $10 more per night, we reserved at Railay Princess Resort, beach-level and very nice. After being greeted with cold towels and fruit juice, we were shown to our room, which was a huge step up and the bathroom was certainly up to par. 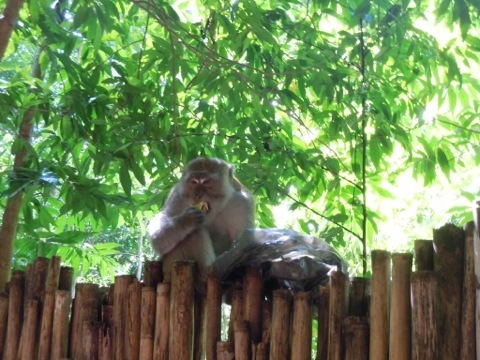 We were warned about the monkeys several times, who apparently have learned about the mini bar and will break in if the porch door is left unlocked. We saw some small claw marks in the wood by the refrigerator that supported this fact. We had some very excellent Thai pancakes for lunch (thin, crispy crepe-like pancakes with sweet or savory fillings) and Thai iced coffee, which I love, before scrambling up to the lookout point and exploring Pranang Cave Beach. It is a gorgeous beach, but the sun was brutal and the water was murky with some sort of algae. 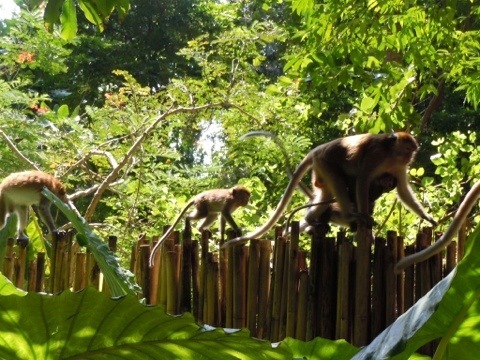 Walking the paths between the beaches we were also treated to a sight of the real locals: a long line of monkeys was crossing from one side of the island to the other on the top of a fence. I know, I’m a nerd, but it was straight out of Nat Geo, with the babies hanging onto their mother’s stomachs and everything. It was great. We headed back to the pool for some relaxing before the evening’s events. The fire show the night before had been delayed by a short rain shower, so we crossed to the east side to catch the full show. 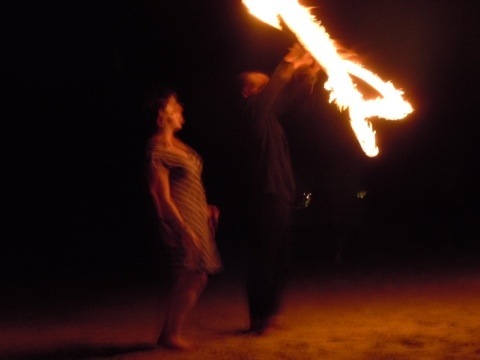 It was pretty spectacular, sitting on the beach with the fire twirler silhouetted against the darkening sky. At the end of the show, he asked for volunteers. I couldn’t resist. After the initial hesitation, it seemed fairly easy and I had a flashback to early days practicing with a baton. 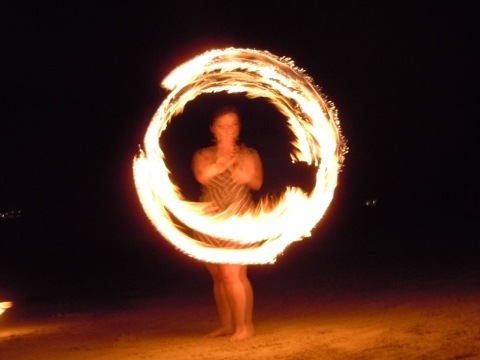 I think fire batons might be on my Christmas list this year! That might seem like a pretty full evening, but we had one more event to experience. 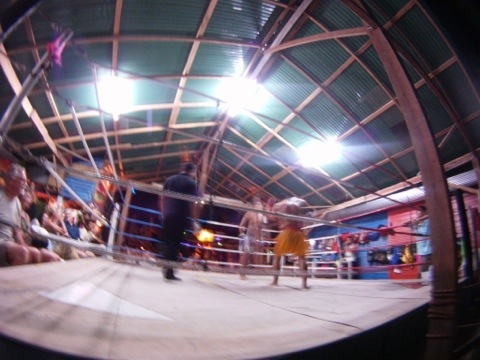 After dinner, we made our way to Bamboo Bar for Muay Thai Boxing. The planners waited for the maximum number of people to show up (and buy drinks) before starting the match, so it was close to 11:30 pm before it got started, but it was worth it for the announcer, if not the actual bout. He was hysterical, organizing a didgeridoo exhibition with audience members (he gave us a little song, too) and interjecting his boxing commentary with exclamations like, “Oh my Buddha!” and “Oh, you look like a monkey!” I think it was his laugh that was the best part, though: a high-pitched, ululating cry that could almost come from one of the monkeys that he was referring to. It was definitely a once-in-a-lifetime experience. Breakfast was included in the rate, so we enjoyed that perk the next morning. Unfortunately, the Railay Princess didn’t have a triple room available for the next night so we went back online and booked next door at the Sunset Resort (which we had originally looked into). Our online price was about 200 baht lower than what we were quoted in person for the same room, so we felt good about it. The room was perhaps our favorite, with a balcony shaded by limbs overlooking the pool. 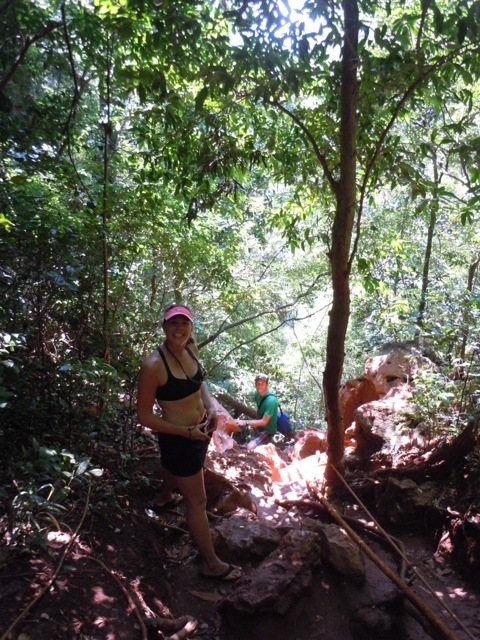 We had plans to explore Tonsai Beach and another lookout in the afternoon, but I had to let Brian and Heather explore on their own as I was having an adverse reaction to something that I ate. Nothing serious, but I definitely wasn’t up for a hike. When they got back, we laid low for the evening and just ordered room service. So nice, living the life! 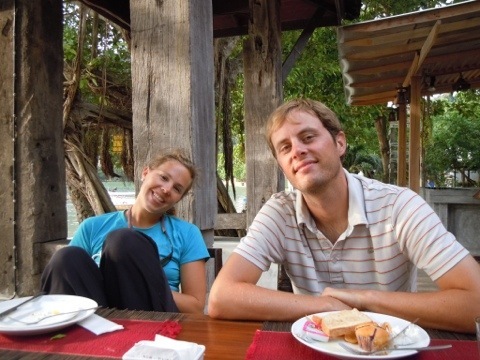 Breakfast was also included at Sunset, which was nice before we caught the ferry to Ko Phi Phi. 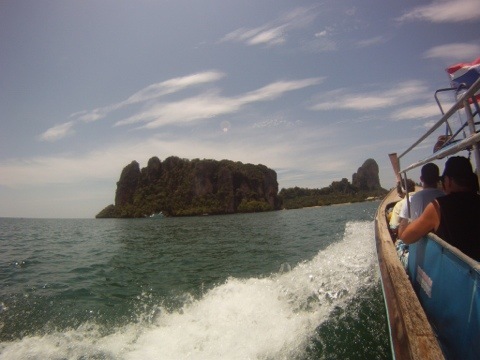 We’re so spoiled, just island hopping around Thailand! 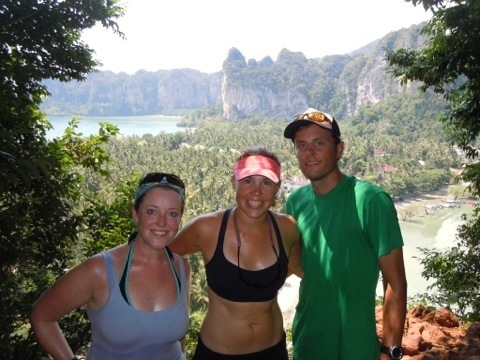 Tags: long tail, Muay Thai, Railay Beach, resort, Thailand. Bookmark the permalink.